It is reported that Archbishop Makarios’ statement in Athens that he suggests the Greek Cypriot community stay away from using violence has been denied by official circles. It is claimed that although he was invited to condemn Greek Cypriots' acts of violence, sabotage and terror, Makarios avoided saying that. 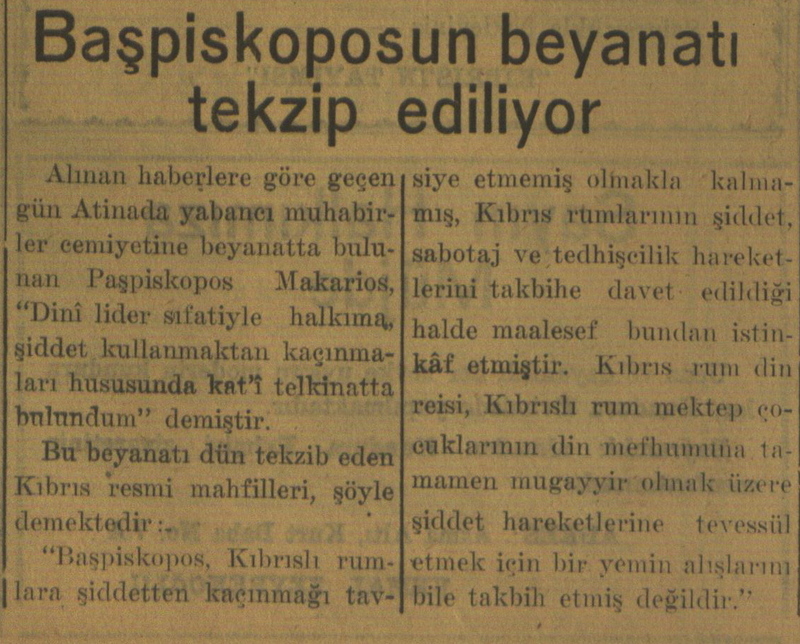 "Başpiskoposun beyanatı tekzip ediliyor" in Halkın Sesi, May 7, 1955, p.1. R.H., “Denial of Archbishop Makarios' statement on his condemnation of the acts of violence in Cyprus, 1955,” Cyprus Critical History Archive: Reconsidering the culture of violence in Cyprus, 1955-64, accessed April 25, 2019, http://ccha-ahdr.info/items/show/17.